Architectural models are usually made to scale. Their purpose is for the architect to use when showing clients. 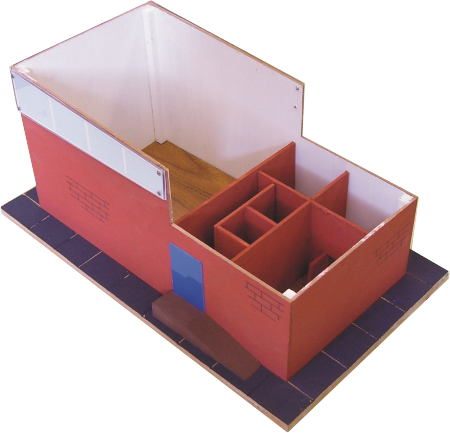 A model can be disassemble allowing the interior to be seen. The model is usually quite detailed and gives a true reflection of the design. The model can be the focus of discussion between the architect and the client. Modifications to the design can be discussed and changes made at an early stage rather than when the building is taking place. The photograph below shows a building which incorporates a conference room and a number of smaller rooms suitable for meetings. The structure of the two roofs can be seen clearly. The model ensures that the client can physically see what the finished building will look like. 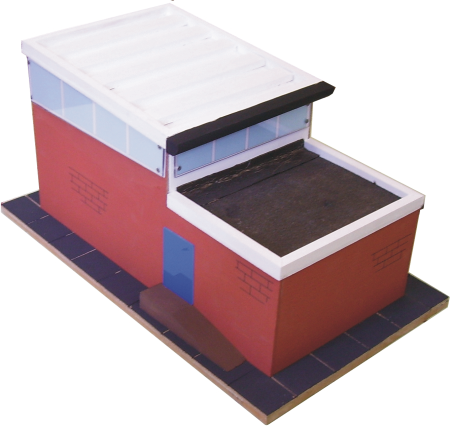 The model has been manufactured mainly from MDF and Perspex. Other materials include tarpaulin for the flat roof and water based paints. The roof of the model has been removed showing the interior. The large conference hall and smaller meeting rooms are seen.